I love this book. This book contains that how importent nature is to us. 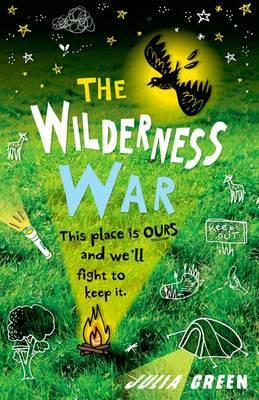 I really liked this book it had loads of of cool people that wanted to save the wilderness because it was going to be built on. A brilliant story about a boy called Noah, his little sister Natalie and his friends Zeke, Toby, Holly, Anil and Asha. Every holiday they play in the place they call The Wilderness, which is perfect for building dens, playing games and staying up all night camping. One day Noah spots a sign in the night and it says 'For Sale'. He and his friends are distraught. Can they save their Wilderness??? I loved this book because I love doing the sorts of things that they do. I found it dramatic and exciting and my favourite part was when they went to the council. I'd rate this book 100/100. Read it! I think you should read this book because it is totally amazing, it is about saving the woodland where Noah and all his friends like to play, and telling everyone the bad news, and defeating people in the government and having fun. It was the best book I ever read in my life! I just like it so much after Beetle Boy. It is the best book I have ever read and I totally recommend this book to anyone who loves the wild and playing outside with friends and having adventures! Best for older kids def aimed at teenagers - voted 1st place in our Chatterbooks group. I enjoyed this book. I think boys or girls would like it. I love this book! recommended to eager readers who are outdoorsy and independent. People are trying to make the bit of country side opposite Noah and his friends houses. Noah and his friends need to fight to protect their animal friends and their dens. They will do anything to stop a bulldozer chopping the tree's and for house developers to build houses there. It is an amazing book, relating to the world today! I'd recommend this book to people who love having having a taste of adventure in the wild; like me!